Saint Raphael’s Church is the daughter church in the Parish of All Saints, South Hobart. 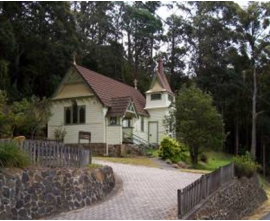 It is situated on Huon Road, Fern Tree, ten kilometres from the city of Hobart. 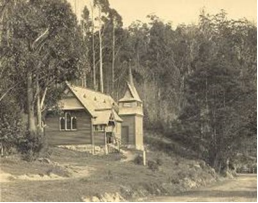 This beautiful ‘Swiss’ style Church was designed by Melbourne architect Alan C Walker and built by local builders William and Charles Gillham. The Foundation Stone was laid in 1892 by Emily Dobson and the Church consecrated in 1893. Previously services had been held in a room at the back of the Fern Tree Inn (now the Fern Tree Tavern) which was opposite the site of the present church. The incentive to build the Church came from residents who were concerned at the use of the Inn for their fortnightly church services. The land and a monetary donation towards the building of the Church was given by Henry and Emily Dobson. The remainder of the cost was donated by Fern Tree residents and members of the wider community. 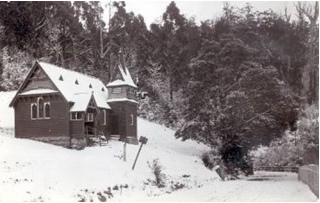 It is a significant building for the Fern Tree community, being the only building to have survived two major bush fires in 1898 and 1967 that destroyed the Fern Tree community. The Eucharist with hymns is offered there every Sunday at 8.45am and on Christmas Day at 8.45am. Baptisms are welcome and are held during the 8.45am Eucharist. Marriages also are welcome. Please contact Fr David at All Saints Parish Office 6223 1795. Further information on Baptisms and Marriages within the Parish of All Saints South Hobart can be found here.